An application to have fun while drawing through easy sketches. 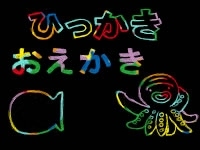 Let's enjoy scratch-drawing with cute Mr. Octopus! 1. 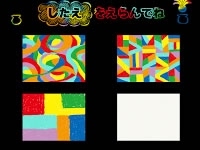 Select the sketch. It will be base color of scratch-drawing. 2. You can put the color of your choice into the selected sketch. 3. Get the ink from Mr.Octopus and then make dark blotches using the ink. 4. Draw as you like! Even though you will use your finger, you can draw sharp lines as if you are using a pointed paint tool! When you finish drawing your picture, show it to Mr.Octopus! 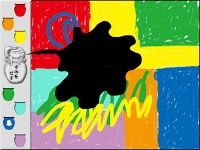 *** In real life while performing scratch drawing (Hikkakie in Japanese), a number of colorful blotches are made using crayons of different color. 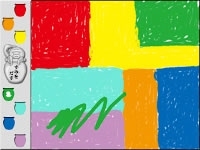 Then using one color the a layer is drawn on top almost covering the whole picture. After that drawing is done using a sharp paint tool. Even though the traditional scratch drawing is fun, this time Kurotekko has brought a new magic to it! 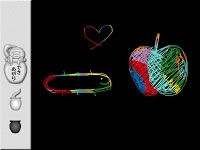 In this app you don't need to put a lot of force that you use in crayon based scratch drawing and don't need to have a sharp paint tool which can be dangerous to kids. On top of that, Mr. Octopus will accompany you in the whole process for extra fun! * DON'T use sharp objects to draw in your iPad Screen. Your finger itself can act as a sharp object in this app. ** If you take the challenge to draw by yourself without the help of Mr. Octopus, be very careful while using the sharp paint tool.